Turkey has illegally forced thousands of refugees to return to Syria, a report by Amnesty International says. The group says about 100 Syrians have been sent back to their war-torn country every day since mid-January in breach of international law. Amnesty says its report exposes the flaws in a recent deal between the EU and Turkey aimed at stemming the flow of refugees arriving in Greece. Turkey has denied sending back any refugees against their will. 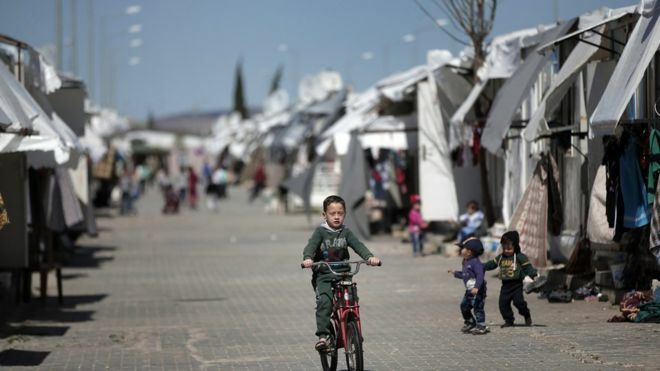 The group says its research in southern Turkey suggested that authorities had been rounding up and expelling groups of about 100 Syrian men, women and children almost daily since the middle of January. Under the “non-refoulement” principle of international humanitarian law, a state is prohibited from deporting individuals to a war zone. Amnesty said one case involved three young children forced back into Syria without their parents, while another saw the forced return of an eight-months’ pregnant woman. It said many of those returned appeared to be unregistered refugees but it had also documented cases of registered Syrian refugees being sent back while not carrying their papers. “The inhumanity and scale of the returns is truly shocking; Turkey should stop them immediately,” said John Dalhuisen, Amnesty’s director for Europe and Central Asia. Under the EU-Turkey deal, migrants arriving illegally in Greece are expected to be sent back to Turkey from 4 April if they do not apply for asylum or if their claim is rejected. In return, Turkey will receive aid and political concessions. But critics of the deal say it hinges on Turkey being a safe country of asylum, which Amnesty says is clearly not the case. “In their desperation to seal their borders, EU leaders have wilfully ignored the simplest of facts: Turkey is not a safe country for Syrian refugees and is getting less safe by the day,” said Mr Dalhuisen. A BBC report in January uncovered allegations of refugees being detained in Turkey before being forced to return to Syria. One refugee told the BBC that guards had driven them to the Syrian border and forced them to sign a piece of paper on which was written “I want to go back to Syria”. Turkey has taken in 2.7 million Syrian refugees since the civil war began five years ago. Many live in camps near the border between the two countries. The Turkish foreign ministry said it had maintained an “open door” policy for Syrian migrants and strictly abided by the principle of not returning people to a country where they are liable to face persecution. “None of the Syrians that have demanded protection from our country are being sent back to their country by force, in line with international and national law,” a foreign ministry spokesman told Reuters news agency. Last year, more than one million migrants and refugees arrived in the EU by boat from Turkey to Greece, triggering a political crisis within the bloc. More than 143,000 have arrived this year alone, and about 360 have died, according to the International Organization for Migration. Most migrants and refugees intend to go to Germany and other northern European countries, but tens of thousands are now stuck in Greece as their route north has been blocked. Human rights groups have said the EU-Turkey deal could force migrants to start using other and potentially more dangerous routes, such as the journey between North Africa and Italy. ← NATO in Sri Lanka?